In the planning stages of this trip I had deliberately avoided a long drive yesterday reasoning that a relaxed evening would allow recharging of batteries. The cost of this was an early start today, and thus we left our overnight hotel at the crack of dawn so as to get to Darien Lake for opening. Unfortunately I'd neglected to allow for a lengthy tailback on the road leading to the United States border, as the officers on the American side were subjecting each car to a ninety second long interrogation. The end result was an unforeseen one hour delay, and I've since learned that we were lucky; apparently the wait can exceed three hours on bad days. By the time we arrived at the park the place was already crowded, and security checks at the entrance meant that it took us over ten minutes to get through the gate with our pre-printed tickets. Rather than take a planned lunch break we decided to grab something on the fly which we could then eat in the predicted hour long queue for Superman - Ride of Steel (#541). The weather forecast had hinted at the possibility of a thunderstorm later, and on that basis it seemed like a good idea to go to the signature coaster first. I'd expected something good, given what the mirror image of this ride was like, but I wasn't prepared for a ride that with one lap became my new favourite coaster. We rode in car two, where throughout the ride we did not feel even a single jolt from the train; instead, there was glorious airtime throughout. There was a slight dead spot at the end of the second helix, though honestly it's feels churlish to even mention that. James and Andrew were both delighted with what they quickly decided was the best coaster of the last few days. Unfortunately, the same could not be said of the remaining coasters in the park. The gentleman sitting beside me on Predator (#542) described the experience as being akin to a car crash, and it was hard to disagree with his assertion; the ride was badly in need of some retracking, and while I have ridden worse I've also ridden an awful lot better. Viper (#543) was scarcely better, with enough bumps on the course to leave bruises all over the body. The only saving grace was an almost complete absence of headbanging; even still, however, once was enough. James got his one hundredth coaster on Mind Eraser (#544), our second SLC in twenty four hours. When updating my own database I discovered that this was also a landmark for me, in this case my one hundredth Vekoma built coaster. It was fitted with a mist generator half way through the course, but though it was running while we waited it had been shut off by the time we were on board. This was, if anything, a relief; though the weather wasn't cold by Irish standards it was nevertheless far below the norm for the United States in mid-August. 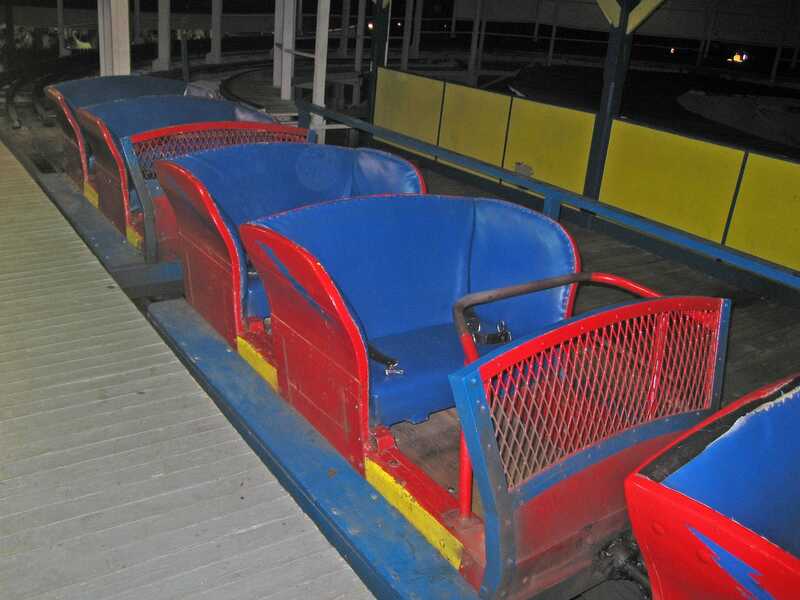 As things turned out the ride was our last at the park; the Boomerang was in an advanced stage of non-functionality, and we were not allowed to ride the kiddie coaster due to us being over the completely artificial height restriction enforced by Six Flags. The rule seemed a little silly given that we had no trouble on an identical machine two days ago, but the operator stood his ground and that was that. 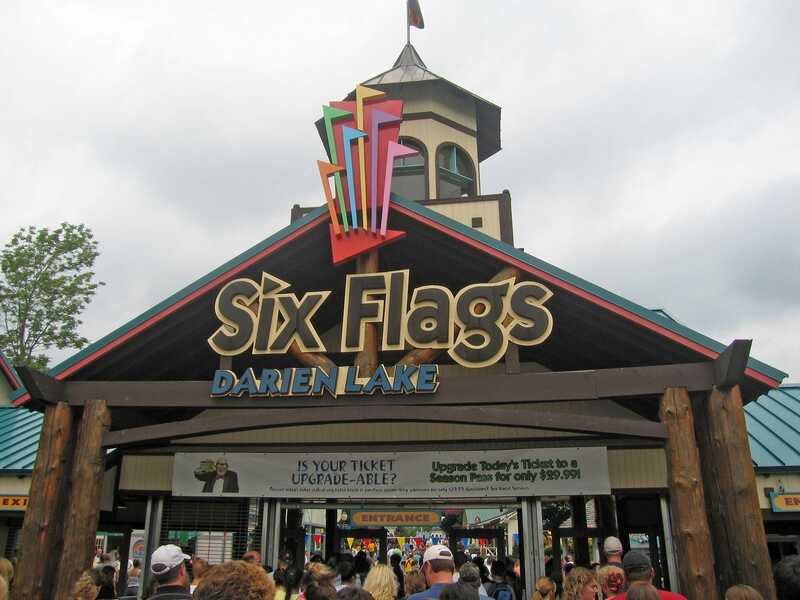 The direct route from Six Flags Darien Lake to Columbus Ohio takes somewhere in the region of six hours. It would not be sensible to attempt a drive of that length without a few stops along the route, and Waldameer Park seemed like an ideal waypoint, being roughly two hours into the journey and only a few miles off the interstate that we'd have been on anyway. The daylight was beginning to fade as we entered the park, but despite that the place was buzzing with people. The lady at the ticket window was able to tell me me that adults were not allowed to ride the Ravine Flyer 3 without an accompanying child, and given that I bought just enough tokens for us to do the two accessible credits and the Ferris Wheel. We decided to do the latter first in the hope of getting photographs before it was too late. A fault with my CompactFlash card caused the loss of two thirds of what I took, though fortunately a representative selection survived. Credit one ended up being Comet (#545), a family sized wooden coaster with a first drop of just twenty-five feet. The ride featured a custom layout but was broadly similar to the one I'd ridden exactly two years before at Wyandot Lake. Only one of the two trains was in use tonight but despite that the wait time was a very respectable five minutes. Andrew particularly enjoyed the fact that the ride still has a manual braking system, a charming piece of nostalgia in a world where modern is so often seen as better. Andrew logged his one hundredth different coaster on Steel Dragon (#546), a Maurer Sohne spinning coaster and a clone of the one I had ridden earlier this year at Drievliet. The version at this park lacks the theming of its Dutch cousin, but makes up for this thanks to its vastly superior ride quality. As with the other version, the cars did not spin as much as I would have liked. However, the tracking was smooth as butter, solving my major complaint. Stepping on to my soap box for a minute, I occasionally get irritated at how steel coasters with an identical layout can ride so differently. If parks would only maintain their rides properly the experiences should be the same. There is no excuse for disasters such as the mouse at Martin's Fantasy Island. In an ideal world we'd have spent another hour or two exploring the rest of the park. There was an interesting looking dark ride that it would have been nice to try, and there could well have been other gems to discover. However we had to be realistic; it was already late, and we had five more hours of driving and another planned stop ahead of us. On that basis we decided to hit the road; perhaps we'll be back some day. It was quarter to nine at night when we walked in through the main entrance of Conneaut Lake Park. Research on the Internet had confirmed a rule against adults on the smallest of the three coasters, and given how late it was we decided against looking for it. Instead, we acquired some ride tickets and entered the queue for Blue Streak (#547). As we approached the station it became immediately obvious that this was a ride maintained in pristine condition with loving care. A light board was visible above the track, showing where on the course the train was. The train looked to be original, complete with a fixed position grab bar, augmented with a seatbelt as a backup restraint. These looked to be a relatively recent addition, presumably required for insurance cover; fortunately they did not detract from the ride experience in any way. The ride followed a simple out-and-back journey albeit one buried for the most part within woods. The faint glow of the rest of the park was enough to barely illuminate the track as we made our way around the course, and the near darkness added immeasurably to the overall thrill. The tracking was remarkably smooth given that the ride is sixty-seven years old this year. All three of us could probably have ridden for a few hours, but it was beginning to get really late to be still more than two hundred miles from home, and as such we had to move on after just one lap. The other adult sized coaster was a Chance Rides Toboggan, a new experience for me, and not an altogether happy one. Toboggan (#548) featured single person cars that were lifted vertically through the center of a tower that resembled a helter-skelter as there was track circling it most of the way down. There was a small drop at the base, followed by a turnaround and a station brake. The enclosed lift design necessitated enclosed cars, and it was this that presented the major difficulty; though I fit in the car easily enough my head was resting directly against the roof. The airtime on the drop caused me to hit my head hard enough to trigger a headache that was still with me several hours later. Anyone over my height would have had serious difficulty. Distance. Waldameer Park was approximately one mile off the drive as planned by my satellite navigation unit, and constituted a diversion of less than two miles when freeway exits are taken into account. 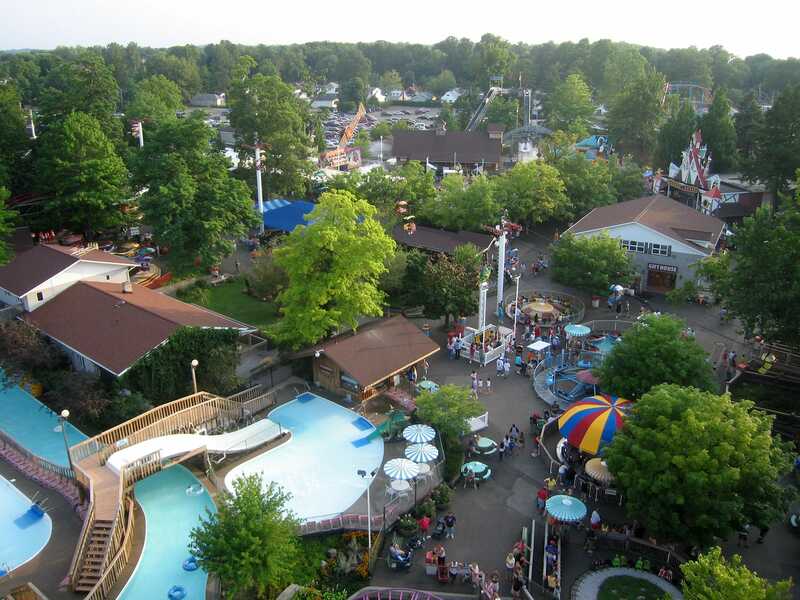 Conneaut Lake Park was more of a diversion, but only added 40 miles to the overall trip. Cost. Both additional parks sold individual ride tickets, limiting the costs to a manageable level and, crucially, made it possible for me to justify stopping the drive for just long enough to hit the coasters. It would have been nice to explore both parks properly, but there just wasn't the time. With luck that will be possible in the future. Future. Conneaut Lake Park closed at the end of 2005, and though it reopened subsequently there was a period of time when its future was very uncertain. It would have been a shame to miss the Blue Streak. Finally, it is worth observing that my two passengers, James and Andrew, appreciated both parks just as much as I did. Neither had any complaints about the fact that we arrived back a shade before two in the morning; they felt the diversions to be worth it. I rest my case.